Prince Georges County Firefighter/Medics, Technical Rescue Team and the members of the water rescue team rescued 3 individuals, including an infant, this evening from their partially water submerged vehicle in Bowie. At around 9:30 pm Fire/EMS units responded to Governors Bridge Road at the Patuxent River in Bowie; an area prone to flooding even days after heavy rain storms. A vehicle occupied by 17 and 18-year-old females and an 8 month old infant had become submerged in high water and stalled out. The slow moving water rose up to the bumper level of the vehicle and entered the passenger compartment up to the seat level. Paramedics evaluated the 3 patients and determined they were not injured and did not need to go to the hospital. Law enforcement officials were notified that Governors Bridge Road needed to be closed. A 67-year-old male has succumbed to burn injuries he sustained at about 11:00 am, Saturday, April 16, 2011. He was discovered by a group home caretaker in the 2800 block of Cricklewood Drive in Fort Washington. No damage to the structure or contents was reported. The male sustained 2nd and 3rd degree burns to nearly 80% of his body. He was transported to the Burn Unit at the Washington Hospital Center where he died yesterday afternoon. Fire Investigators from the Fire/EMS Department's Office of the Fire Marshal continue to investigate the cause of the fire. 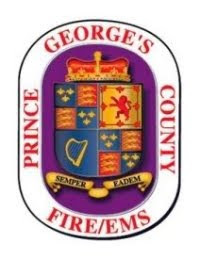 A 4:30 pm fire at the Mall at Prince George’s Plaza in Hyattsville was caused by a malfunctioning electrical transformer and caused an estimated $200,000 in fire loss. A house fire in the 3100 block of Maygreen Avenue in Forestville caused an estimated $8,000 in fire loss. No one was injured and the cause was listed as accidental and attributed to utility lines igniting a fire in the roof area. Two homes were damaged as a result of trees falling on them. Both incidents occurred at about 4:30 pm at 15908 Kerr Road in Laurel and 20D Hillside in Greenbelt. No injuries were reported. Additional information about these and other incidents that occurred on Saturday, April 16, 2011, can be found at www.pgfdnews.com.